Yowza!! offers both national and local businesses the ability to grow their customer base and increase customer loyalty. -David Teichner, CEO of Yowza!! Yowza! !, the leading location-based mobile coupon app, today launches a national sweepstakes to grant winning businesses a free year to list coupons, offers and announcements. Revolutionizing the mobile marketing trend, Yowza! !’s location-based m-coupons give retailers a unique and relevant way to bring nearby shoppers through their doors. 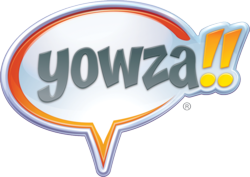 Retailers can easily enter the sweepstakes through Yowza!! 's Facebook page, where a new winner will be drawn each month. The Yowza!! app, a free download for consumers, lists offers within a 1 – 50 mile radius. Shoppers can now find coupons for their favorite places, wherever they are, on demand. Technological advances have changed the way businesses communicate with shoppers. Yowza! !’s mobile coupon app allows businesses to reach consumers where they spend most of their time: on their smartphones. Because all Yowza!! mobile coupons are location-based, they target relevant nearby shoppers that are most likely to visit. Sweepstakes winners will receive a free year to list up to 3 offers, coupons or announcements simultaneously on the app. Yowza!! also gives business owners the flexibility to update these offers as often as they choose. Bottom line, Yowza!! helps businesses grow and consumers save. Businesses can enter to win the Yowza!! sweepstakes here: http://on.fb.me/yowzasweeps. Anyone can download the free app for iPhones here: https://getyowza.com/download/iphone or for Androids here: https://getyowza.com/download/android. For media inquiries and/or to arrange an interview, please contact Tyler Barnett at 323.937.1951 or tyler(at)tylerbarnettpr(dot)com. Yowza! !® is the leading location-based mobile coupon, offer and announcement application, saving millions of consumers money on everyday purchases while increasing sales at thousands of local and national retailers, including McDonald's, Dunkin' Donuts, Big 5 Sporting Goods and Guitar Center. Businesses have the ability to add and update offers in seconds, effectively track results and dramatically increase sales by reaching new and existing customers with compelling coupons and information. Yowza!! was co-founded by television and film writer/producer/actor Greg Grunberg, who is best known for his roles in hit series Heroes, Alias and Felicity.